An important part of NASA's aeronautical research involves development of technology for future vehicles capable of airbreathing hypersonic flight, which by definition is flight faster than Mach 5, or five times the speed of sound (about 3,300 miles per hour). Over the past decade, NASA has conducted several hypersonic exploratory investigations and built a technology base in such areas as hypersonic propulsion, cryogenic fuel, materials and structures, computer science, and integration of engines with hypersonic airframes. A technology of particular interest is the scramjet (supersonic combustion ramjet) propulsion system, which burns a mix of hydrogen carried aboard the vehicle and oxygen scooped up from the atmosphere. One possible configuration of a future airbreathing hypersonic vehicle that could cruise within the atmosphere at speeds up to Mach 10. 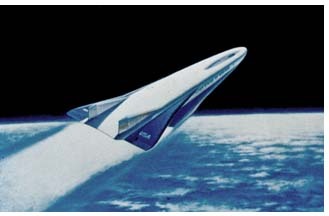 In 1997, NASA will initiate a new effort to advance hypersonic technology for airbreathing vehicles. Called Hypersonic X-Vehicle (Hyper-X), it is a technology development program intended to further expand the knowledge base in this area of aeronautics. Successful development of the essential technologies would afford potential for future application in global reach military aircraft or, in space operations, as the first stage of a two-stage-to-orbit vehicle. Preliminary design, analysis and wind tunnel work was conducted in 1995-96. The program contemplates a five-year effort, beginning in Fiscal Year 1997, involving wind tunnel and flight tests of a subscale, unmanned experimental airframe powered by an airframe-embedded scramjet engine. Flight tests, to begin in 1998, will be conducted at specified test points up to Mach 10.